Drive Shaft Components | Machine Service, Inc. 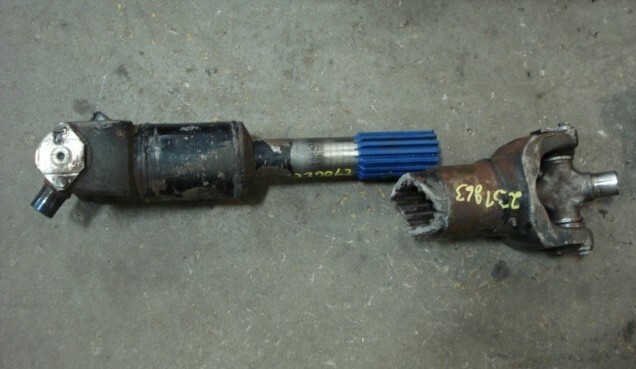 Shock loads are the usual cause of almost all failures where a part breaks. Spinning tires that grab abruptly. Backing into a loading dock, slamming under a parked trailer or trying to pull away with the trailer brakes locked. Check the U-joint operating angle and fix it if it does not meet recommendations. Putting too much torque through the yoke. Calculate the torque transmitted by the engine/trans combination. Change to a yoke having a higher “torque” rating if necessary. 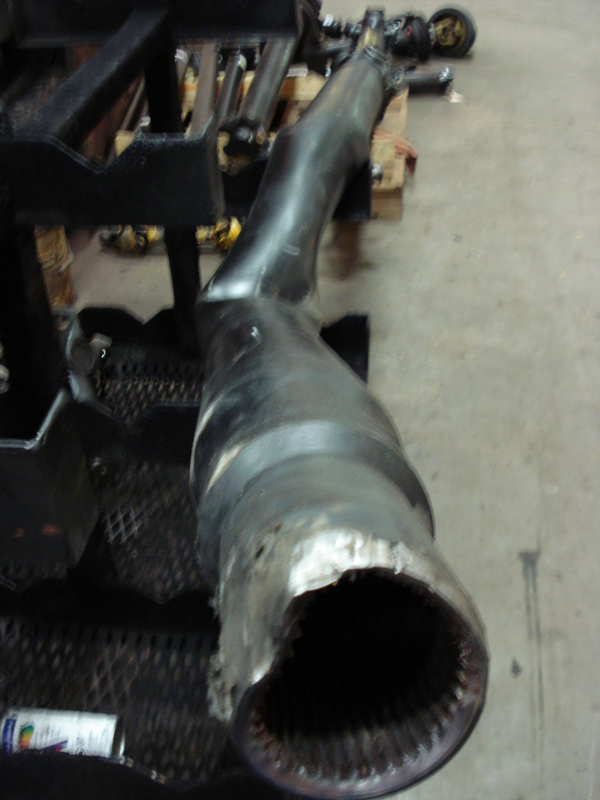 Improper welding when the drive shaft is assembled can cause tube yoke failures. Most drive shaft manufacturers recommend that tube yoke circle welds be started in line with the tube yoke ear and 180 degrees from the tube weld seam. 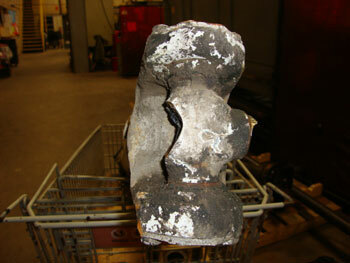 If you experience a failure of a tube yoke, contact Machine Service engineering for assistance. Slip yokes sometimes crack near the outer end of the spline if the drive shaft is not properly installed. Machine Service usually recommends installing drive shafts so they operate at mid-slip. 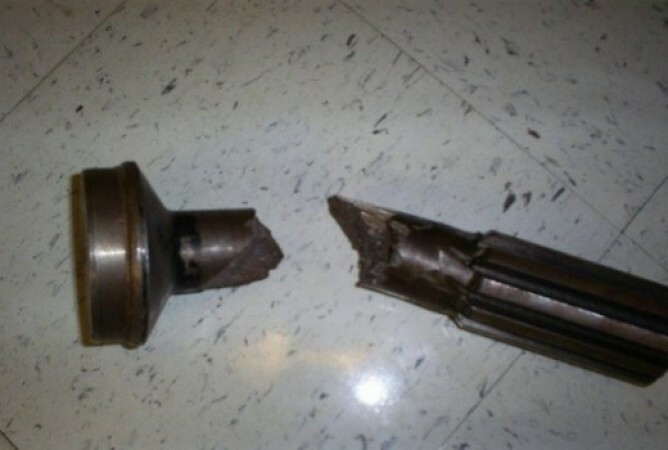 Contact Machine Service engineering if you suspect your drive shaft may have experienced this type of failure, Your drive shaft tube may need to be lengthened. End yoke ear failures are sometimes caused by improper bearing strap bolt torque or by improper handling of the bearing strap and bolts. Bearing straps serve two purposes. They retain the U-joint in the yoke and they do not allow the U-joint bearing to rotate in the bearing “pocket” of the yoke ear. Rotation in the yoke ear will cause excess wear on the locating tangs in the yoke and will lead to misalignment of the drive shaft in the drive train. Misalignment causes vibrations. Proper torque on the bearing strap bolts actually “stretch” the strap around the bearing cap and stop it from rotating in the yoke ears. This “de-forms” the strap and makes it non-reusable a second time. Bearing straps that are re-used may allow the U-joint bearing to turn in the yoke and may cause excessive wear on the locating tangs in the yoke which may lead to premature failure of the yoke ears. Machine Service engineers ALWAYS recommend replacement of bearing straps when a U-joint kit or drive shaft is serviced. Large U-joint angles at the front end of a coupling shaft create secondary couple loads that try to “straighten” themselves out twice per revolution. This load causes a force that “travels” down the centerline of the drive shaft and creates a bending on the drive shaft. These components cannot bend so they load the bearing, or the surfaces that attach the bearing to the drive shaft. The first evidence of a secondary couple problem occurs in the rubber cushion of the center bearing. It starts to fail and black dust appears around the bearing. There is only ONE WAY to control secondary couple loads… ALWAYS make sure the operating angle at the drive end of your coupling shaft is less than ONE AND ONE-HALF degrees. Do whatever is necessary to “adjust” the operating angle at the front of the drive shaft. Add or remove shims from the bearing, if necessary, but if you add shims make sure you re-check all angles of any shafts connected to the coupling shaft to make sure they are still correct. ALWAYS inspect your center bearing at normal service intervals. You should not see any black “dust” around the bearing or on the bearing bracket. If a black dust is present, you may have an operating angle problem and you should use a protractor to measure and calculate the size of the U-joint operating angle at the front end of the coupling shaft. It should be small, less than one and one half degrees. Extra heavy-duty drive shafts, those with heavy wall tubes, can easily weigh in excess of 100 lbs. Engineers “tune” the center bearing in a shaft to the dynamics of the vehicle and the weight of the drive shaft. That is why there are center bearings with “slotted” rubber cushions and center bearings with “solid” rubber cushions. Most center bearings with slotted cushions will not be “stiff” enough to support the weight of extra heavy duty shafts and the slots will collapse. Center bearings should be inspected at regular service intervals. Check the slots in the cushion and if they are collapsed, replace the entire assembly with a center bearing that has a solid rubber cushion design. Keeping this in mind, most 1760 or 1810 series drive shafts have heavy wall tube and should probably have a solid rubber center bearing.